Add cumin, coriander, mustard, fennel, allspice, peppercorns to a spice grinder. Pulse until crushed. Add salt and brown sugar; pulse until combined. Season pork all over with spice mixture. Heat oil in a large skillet set over medium heat. Cook pork chops for 3 to 5 minutes per side or until just cooked through and juices run clear, with a blush of pink in the centre. 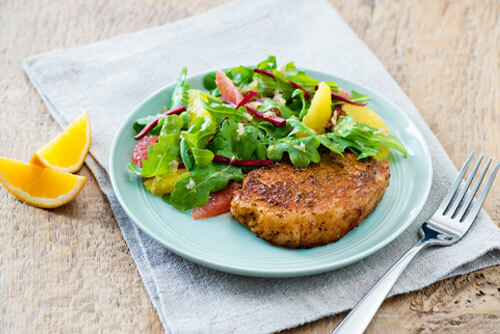 Serve pork chops with Arugula Citrus Salad. Whisk oil with vinegar, shallot, maple syrup, salt and pepper until combined. Set vinaigrette aside. Toss arugula with citrus and vinaigrette. Garnish with beets and serve. *How to cut a citrus fruit into supremes: slice off the top and bottom of citrus fruit. Stand fruit on one of the cut ends. Slice off the outer peel following the natural curve of the fruit, trying to remove the bitter white pith. Working over a bowl to catch all the juices and using the membranes as a guide, cut each segment free from its membrane, letting it fall into the bowl. For some added crunch, try adding chopped pecans.